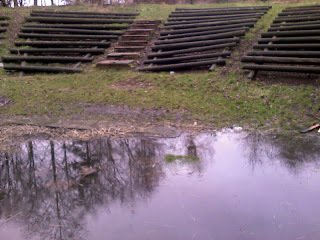 Above : Another first for Fordell - the world's only combined swimming pool and campfire circle. Four weekends into the new season and things were still pretty quiet on the camping front, although a few keen scout groups from Fife and Glasgow decided to defy the weather and come anyway. Most of the site was unuseable due to the recent rainfall, but a few dryish spots were found and camps set up. Campfires look like they will be a long way away as the campfire circle is still completely submerged; at the very least they might require an extra couple of firelighters to get going. Above : In the absence of a ladder, Jean stands on the next best thing - Ginga's left shoulder. A healthy staff turnout and few activities on the saturday led to a mass-decorating session in the staffhut. 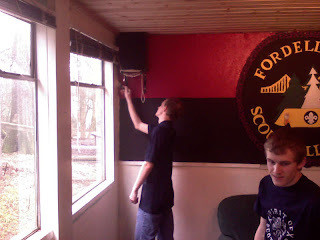 After lots of work last year in the hut replacing ceilings and lighting, the next stage was to paint the lounge and toilets. After an intensive shift all-day saturday, the lounge had been treated to a shiny new coat of white eggshell paint, as had most of the staff's hands. Unfortunately no-one had remembered to buy any thinners or hand-cleaner beforehand so Stevie, as the only one not covered in paint, was despached to Homebase to pick some up. The toilets were also treated to a bit of a makeover, with a nice lilac for the girls and a macho blue for the guys (who didn't like the lilac much). 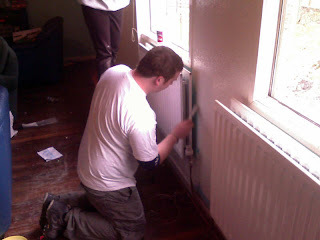 Above : Intricate brushwork was required to paint around all the spiders' webs in the lounge. In the evening, the site welcomed the local Inch Scout Fellowship who were holding their annual Burns Supper in the Henderson building. Some of the Fordell staff attended and were treated to a fantastic 5-course meal (actually 6 since most had a second helping of the haggis starter). After the traditional formalities and some particularly bad jokes by chairman and retiring site quartermaster Pete, the evening continued until the early hours with a healthy mix of conversation and karaoke. 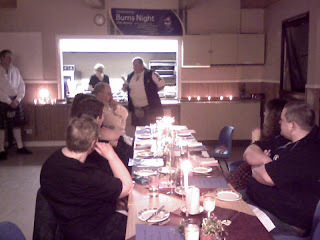 Above : The traditional part of every Burns Supper - Brian reads out the football results. Sunday saw a bit more decorating work carried out in the hut, along with the now-traditional ceremony of starting up the space-bus (see previous post) to keep its batteries charged up. Things should start getting a bit more busier from now on - the first busy weekend being the new activ-8 camp which is being held on th 15-17th February.